Made up of the 20 northeastern provinces of Thailand, Isaan is often overlooked as a travel destination because it lacks any coastline with sparkling beaches to draw sun-worshipping tourists. A patchwork of language and culture, Isaan is a blend of Thai, Laotian, Vietnamese and Cambodian culture largely untainted by the tourist trade, and visitors to the area delight in discovering the 'real' Thailand. The attractions in Isaan aren't as well-known as Ayutthaya or the Temple of the reclining Buddha, but they are no less fascinating, and a totally different experience from the tourist traps of Southern Thailand. The Mekong Valley follows the river of the same name, meandering through the region. 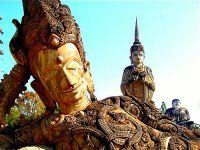 Towns like Nong Khai and Nakhon Phanom make great bases to explore the valley from, and offer attractions of their own, including the fire boats of Nakhon Phanom and the bizarre but fascinating sculptures of Sala Kaew Ku in Nong Khai. Loei is a beautiful town with a budding ecotourism sector that hosts several colourful festivals throughout the year, including Phi Ta Khon, known as the 'Thai Mardi Gras'. Udon Thani is home to possibly the best-known tourist attraction in Isaan, the UNESCO-certified Ban Chiang archaeological site. The city of Nakhon Ratchasima is one of the largest in Isaan. Its proximity to Bangkok makes it a popular stop on travels to Isaan, as it has excellent transport links to the rest of the country. Nakhon Ratchasima also makes a great base to explore attractions like Khao Yai National Park and the Khmer temples of Phimai Historical Park.